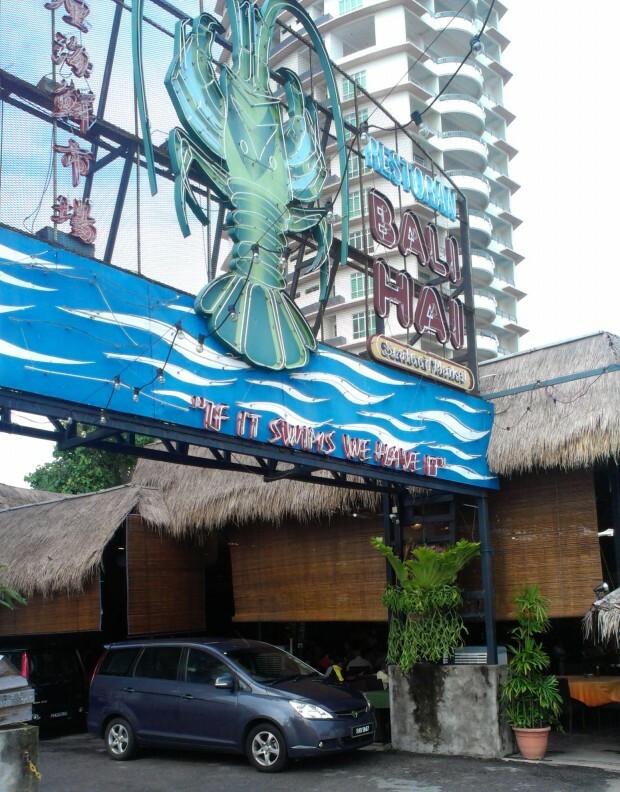 Bali Hai is just a few minutes walk away from home. I haven’t been for a while as I have been away quite a lot. 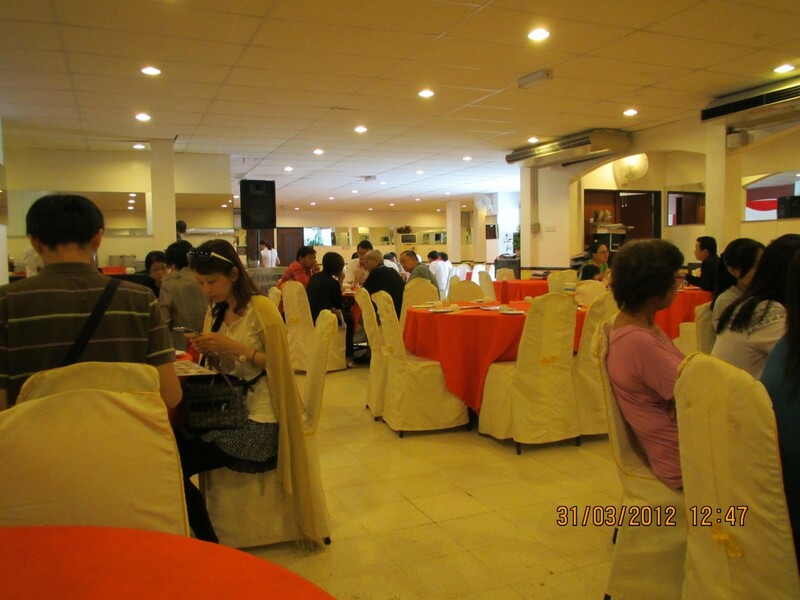 Last time I wrote https://tropicalexpat.wordpress.com/2012/04/06/penang-dim-sum-yum-a-visit-to-bali-hai/ was about a year and a half ago. This morning we decided to breakfast there. As I write this, the main impression I have is how expensive it has become. The same owner had Coffee Island, a coffee shop / restaurant, also close to where I live. Around Chinese New Year a couple of years ago prices dramatically increased in Coffee Island, and I, once a regular visitor, just stopped patronising it. 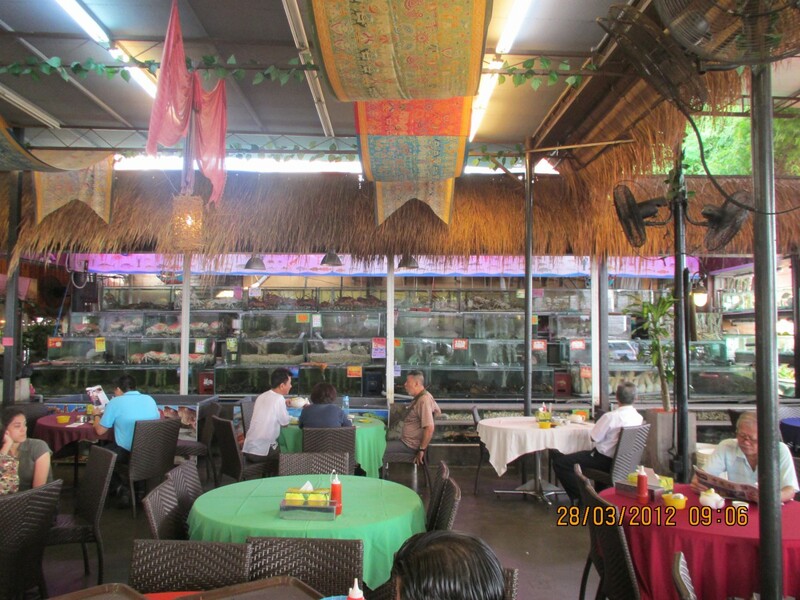 This once very popular spot lost so much business they closed, and since then have tried various different businesses there – hawker centre, Thai Restaurant and others, none of which lasted for long. There may be other factors involved, such as Straits Quays opening around that time, but the big price rise is the major one I think. I fear they are making the same mistake with Bali Hai now. There were far fewer patrons than I expected for a Saturday mid-morning. I felt the food was not as tasty as in the past couple of years. They have changed the panel to the kitchen to glass so you could see in – if they hadn’t piled chairs and tables against the wall there. Yes, we ordered more this time than the visit I recorded a year and a half ago. 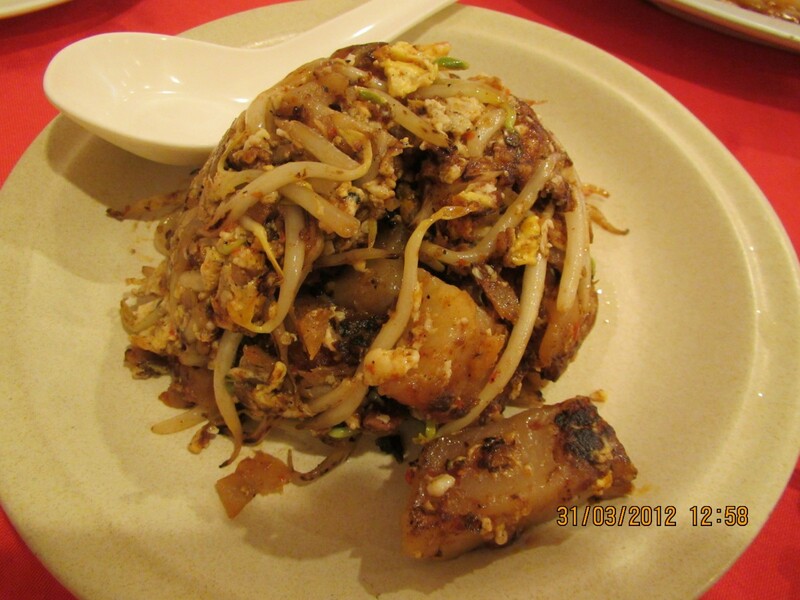 But you can see that the ones we usually order used to be RM4 each, and are now RM5, a 25% increase. 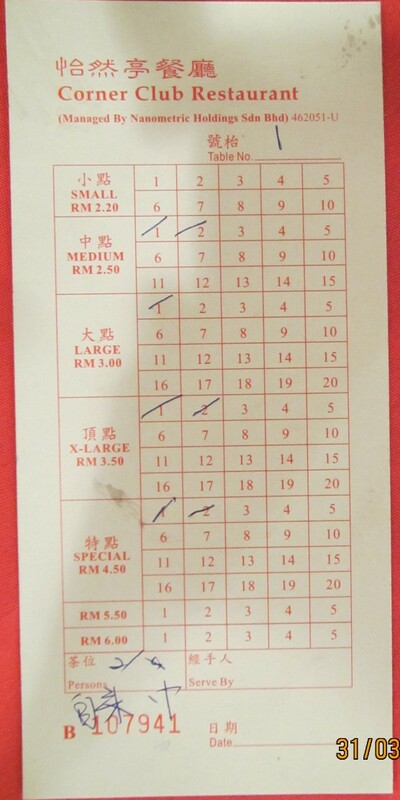 You can also see that there was no RM8 category. 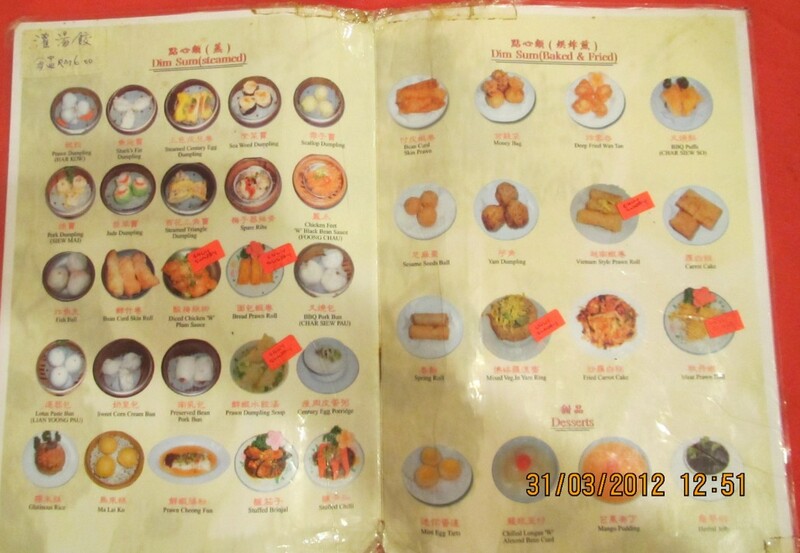 As none of the dishes’ prices are marked when you choose them, and they mostly don’t speak English, you can’t choose easily according to price or value. The view is still nice, the atmosphere better than most Dim Sum restaurants, and parking available and easier now, as there are fewer customers. 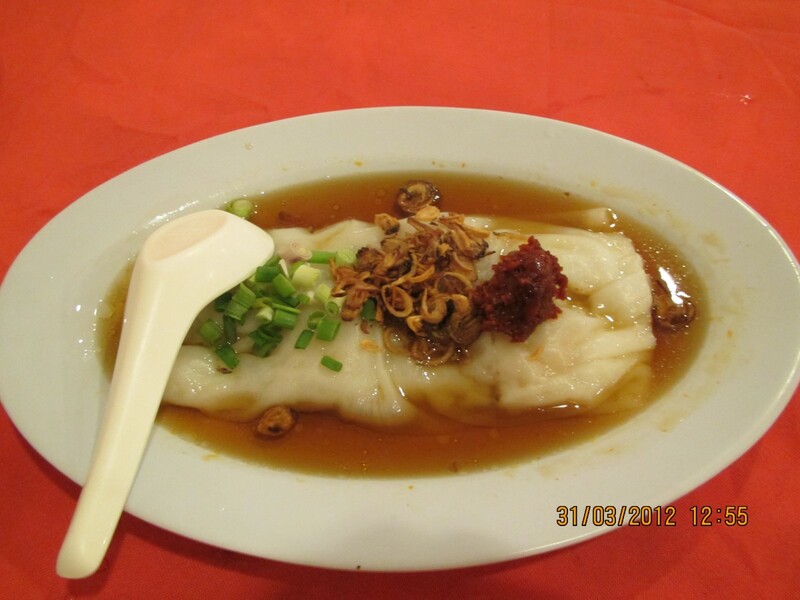 Hours: 7AM until 1PM for Dim Sum, and until late evening as a seafood restaurant. Free WiFi – no password necessary, just find the Bali Hai broadcast. 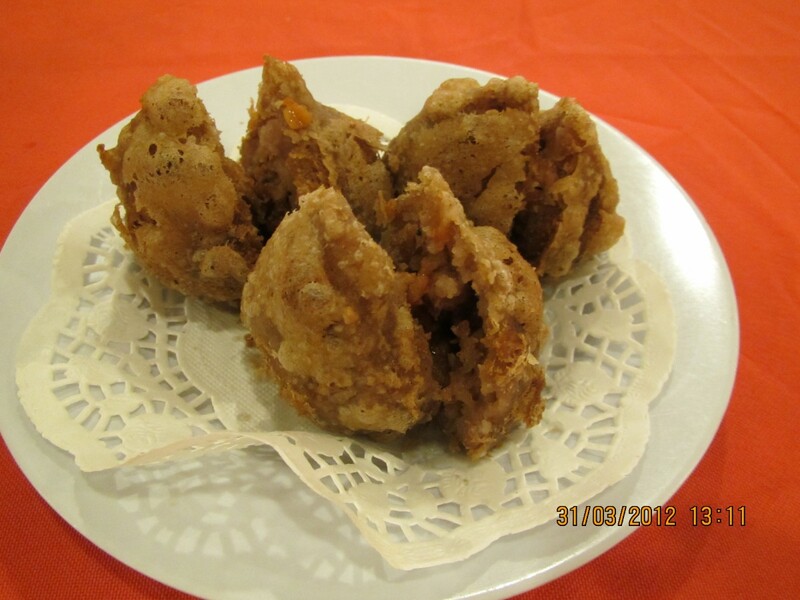 The Corner Club is another Dim Sum restaurant whose quality has improved recently. 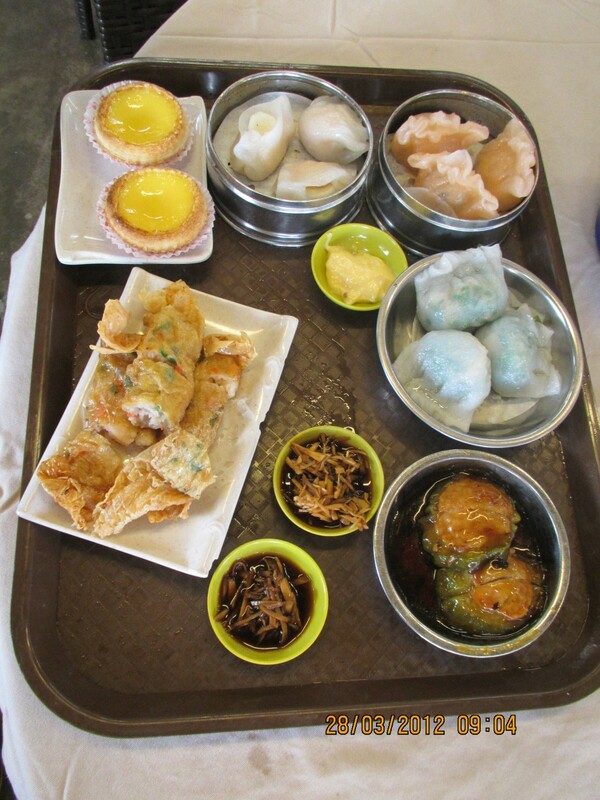 If I want to eat Dim Sum early in the day, I usually choose Bali Hai (see a previous post). But if I want to eat Dim Sum around lunchtime, I come to the Corner Club. 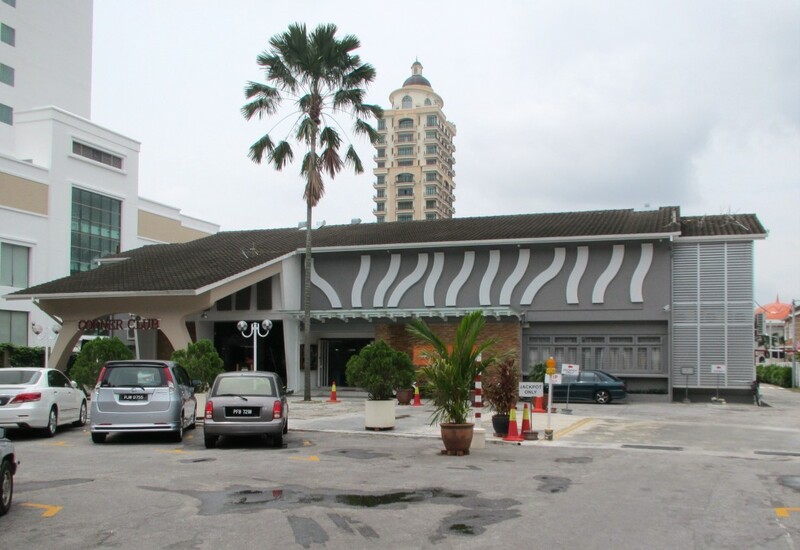 It is located on Gurney drive just past the Evergreen Hotel, if you are driving towards Gurney Plaza. It has parking, which costs RM3. 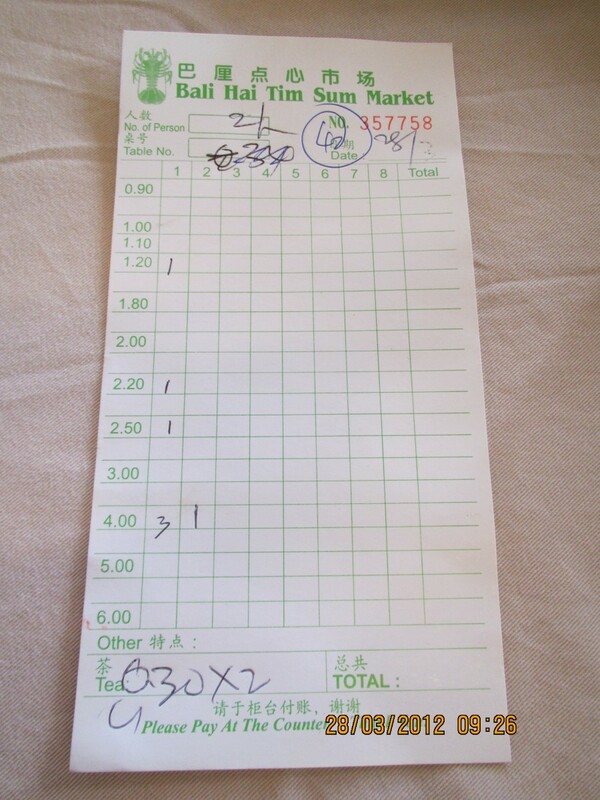 If you present your receipt when paying for your meal they will refund RM2. Many people appear to park here, but eat elsewhere, too. I have never found a reservation necessary, at least for two people. Most items on the menu are usually available, but egg tarts are often finished before I get there. So order them immediately if they are available. These a photos of a few of the dishes we ate. 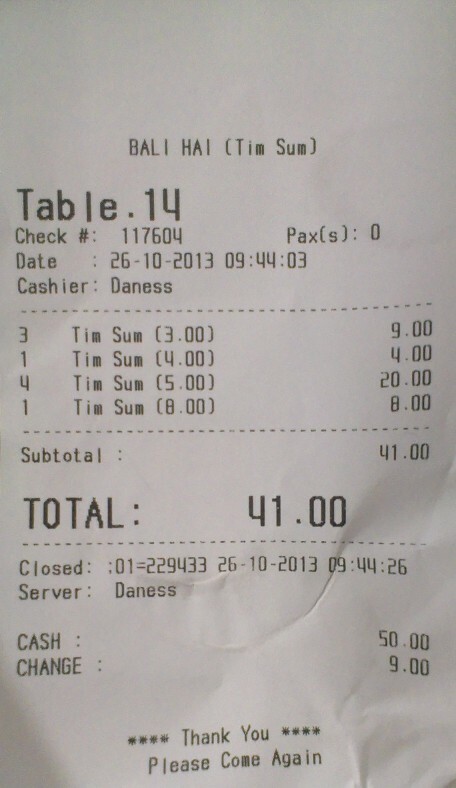 I think the total was around RM23, but then service charge and government tax were added, and it became RM27.55. 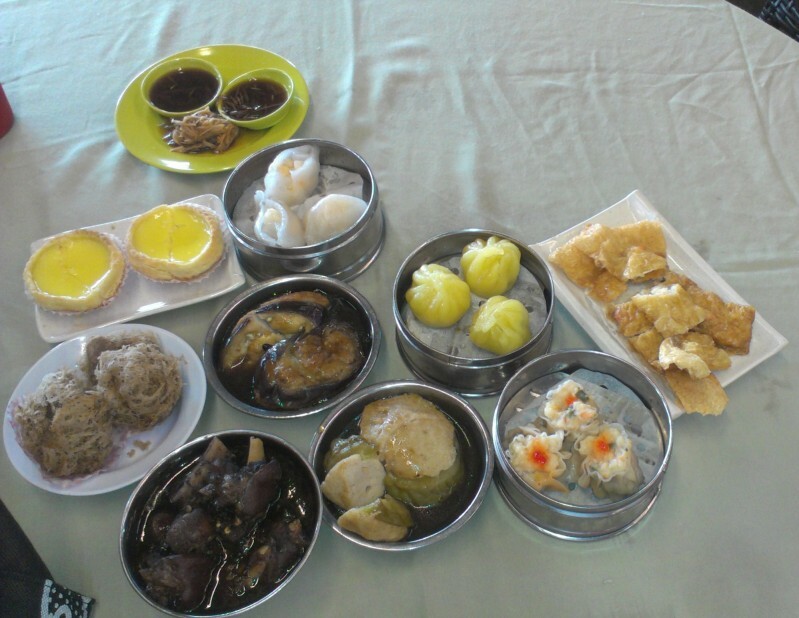 Penang Dim Sum – Yum. 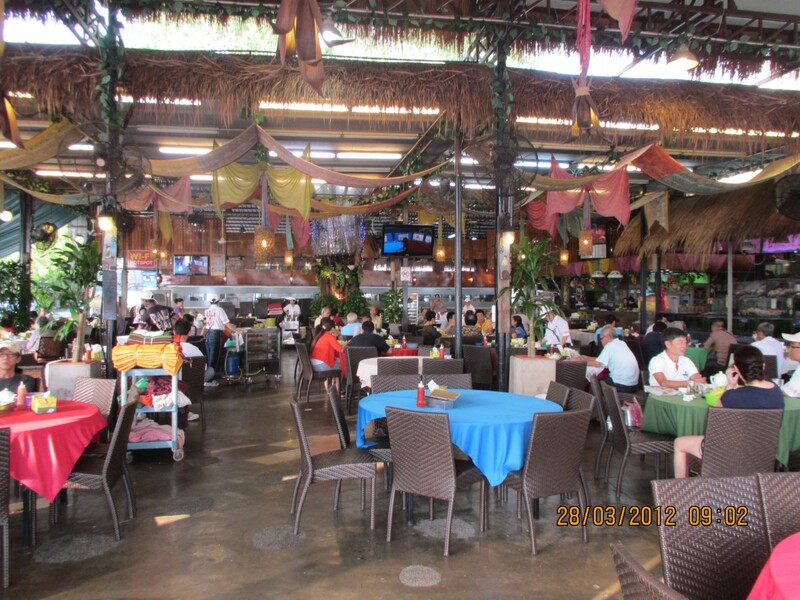 A visit to Bali Hai. There are two Dim Sum restaurants I particularly like. 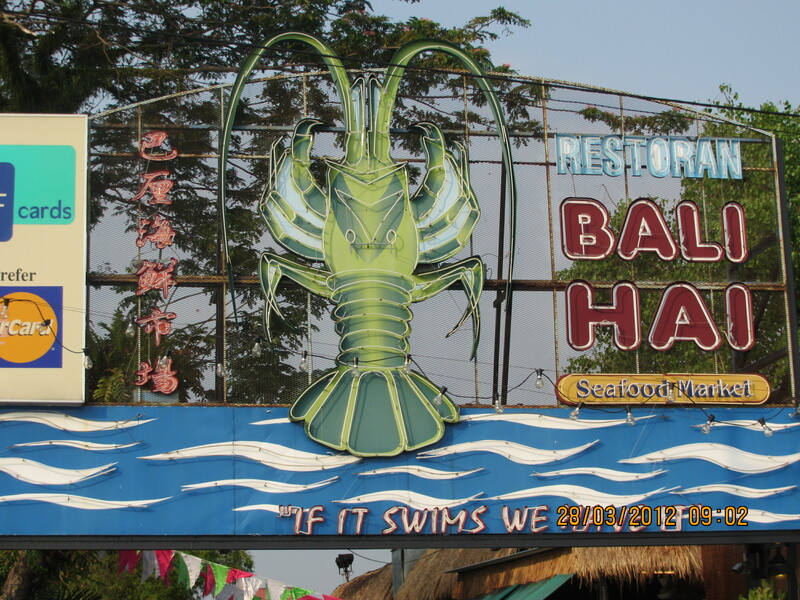 Today I will cover one of them, Bali Hai – very touristy, but very popular with locals, too. 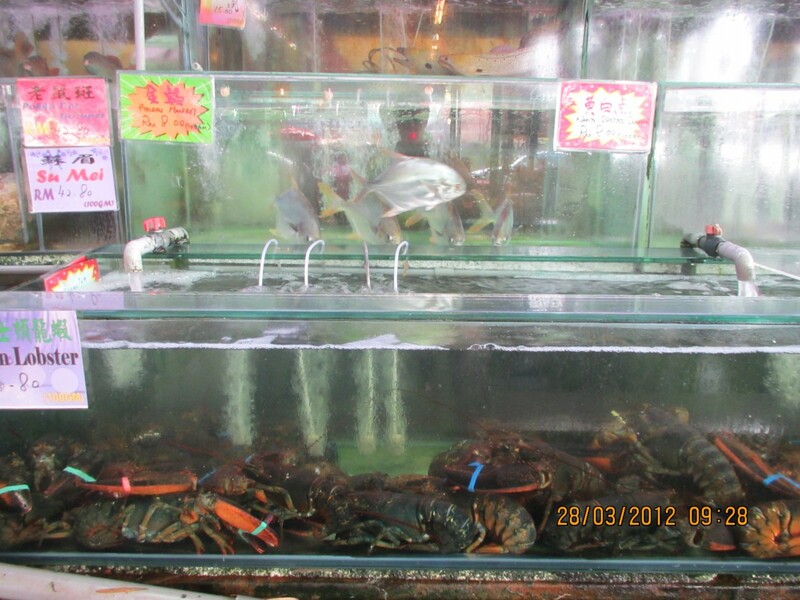 After Dim Sum is finished, it is a seafood restaurant, and is open until late. In the mornings almost all of the patrons are locals, but in the evenings the proportion of tourists is much higher. 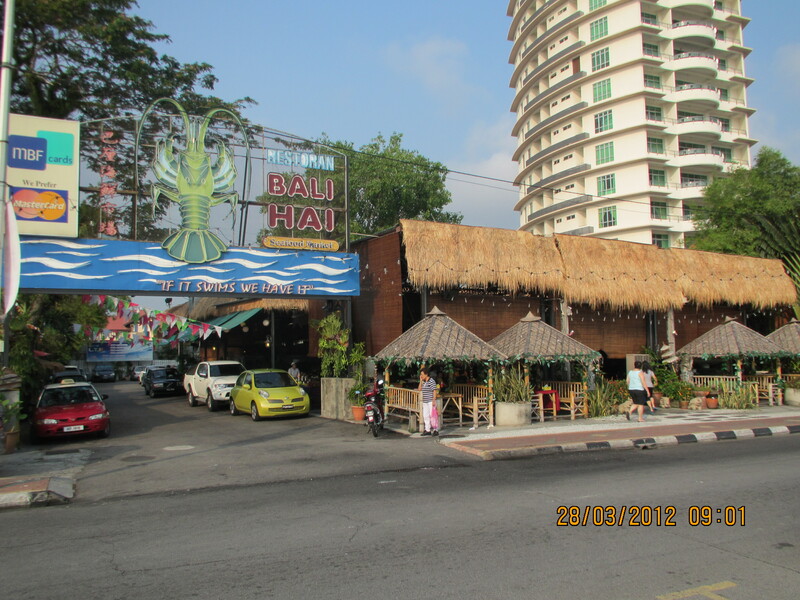 Bali Hai is located around the middle of Gurney Drive, and it has parking, which is usually quite full when the restaurant is at least half full. They serve Dim Sum in the morning from 7AM to 1PM every day, but the earlier you arrive the better selection there will be. And Sunday mornings is best, as it is the most popular time for locals to go, so the selection then is best of all. But it can be a little difficult to get a table – you may have to share a table with others. The food quality had declined by last year (2011), and I more or less stopped patronising the restaurant, but towards the end of last year the quality markedly improved, and since then it is very good. 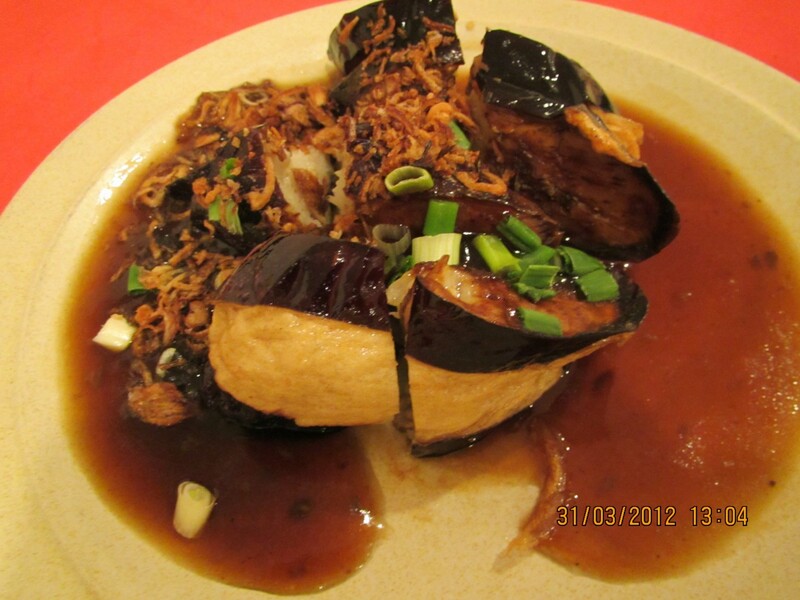 There are more blogs about food and restaurants in Penang, seemingly, than any other topic, so I won’t reinvent the wheel, but rather talk about it from a slightly different perspective. Firstly, you need to find a table. If there are no tables you can ask to share with another table where there is space. 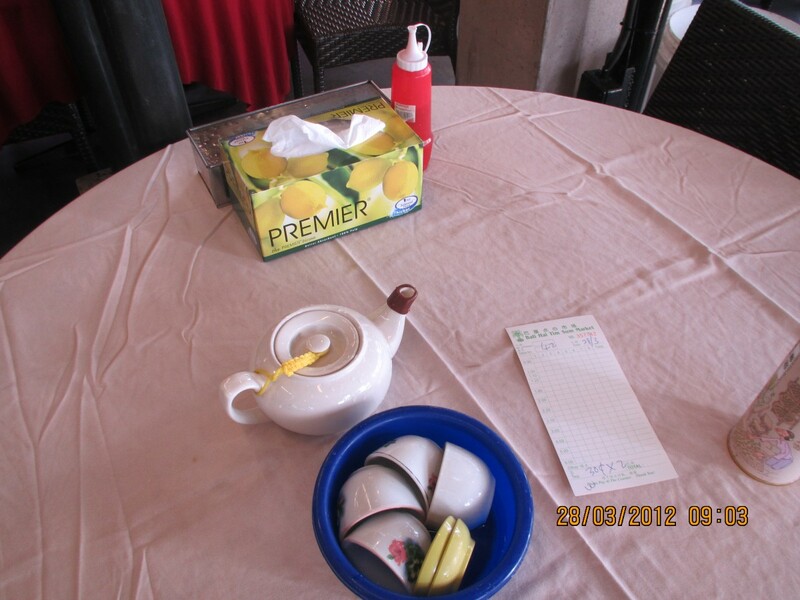 On the table you will find tissues, a stainless steel container with chopsticks, and a plastic chilli sauce container. 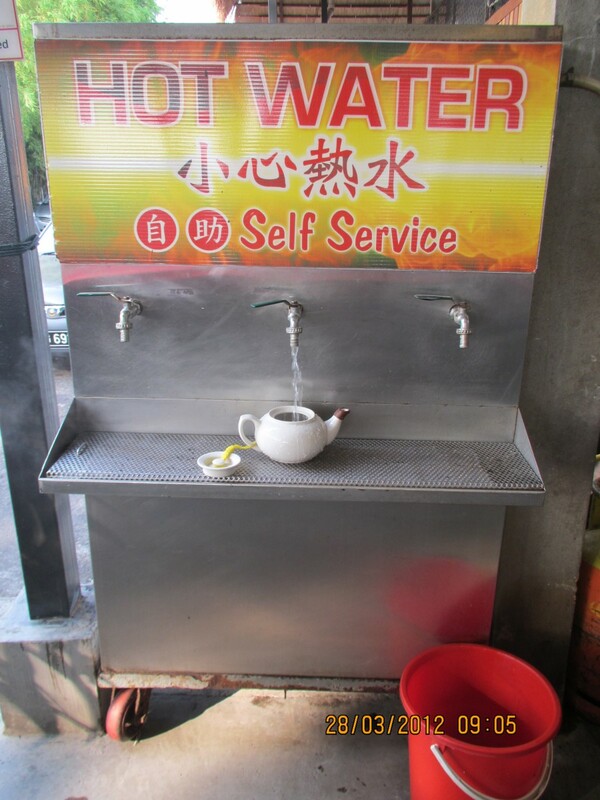 An attendant will bring you the bill card, a flat plate each, and if you ask for tea or hot water, an empty teapot, and a bowl with very hot water containing two teacups each, and small sauce dishes. 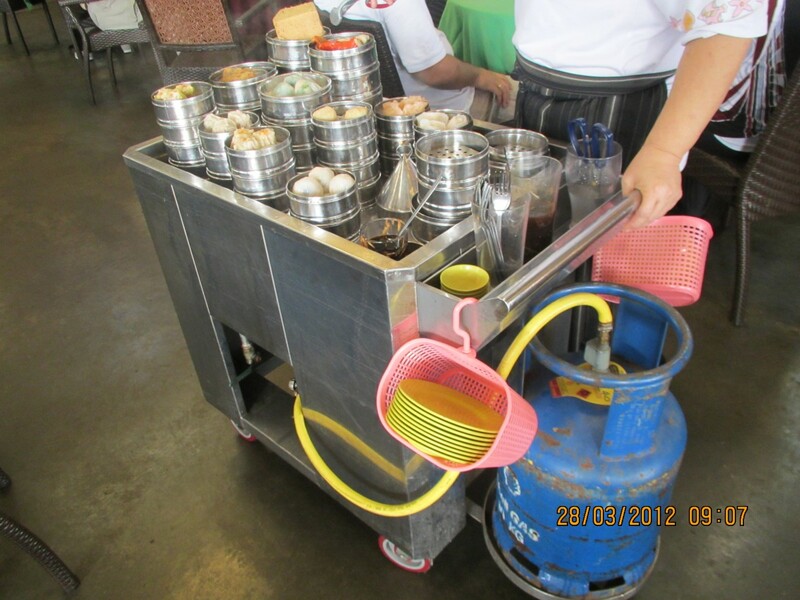 We bring our own tea, which saves 70 sen per person – but allows us to have a tea we like. 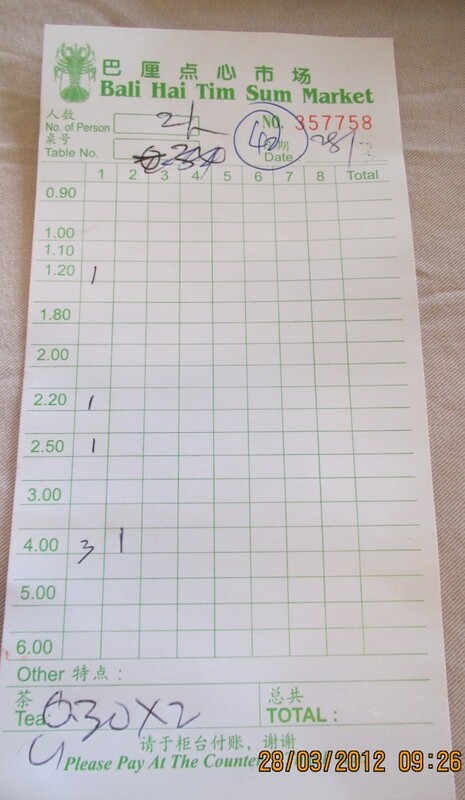 If you want separate bills, just ask at this stage and you’ll get a card each. Put your tea in the teapot and go and get hot water from the machine. There are ladies with trolleys circulating, and you can ask for what you want, and your bill will be marked appropriately. 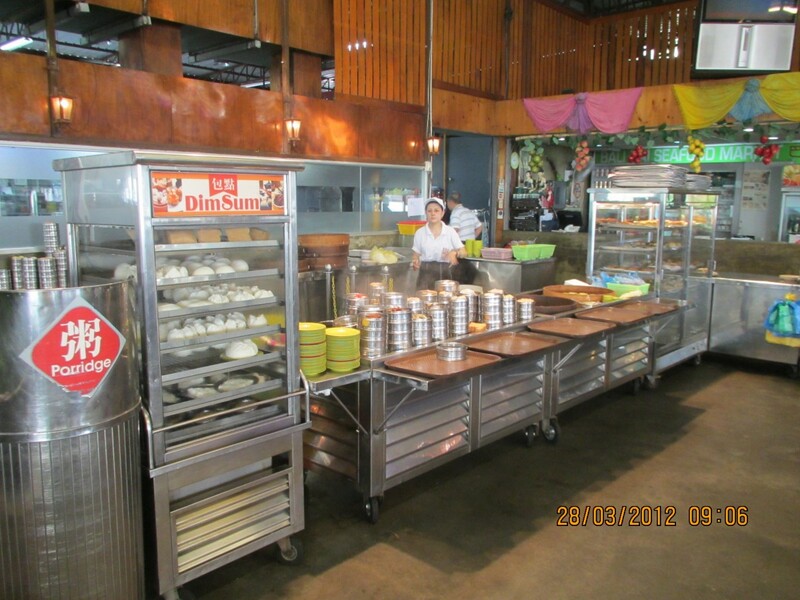 You can also go to the counter, where there is a much bigger selection, and take the dishes you want. They will cut the bigger food into smaller pieces. And take away your goodies on a tray. Once you have finished you can easily calculate your bill.